Getting lost in the side streets of a city can be a great way to truly explore everything that a city has to offer. 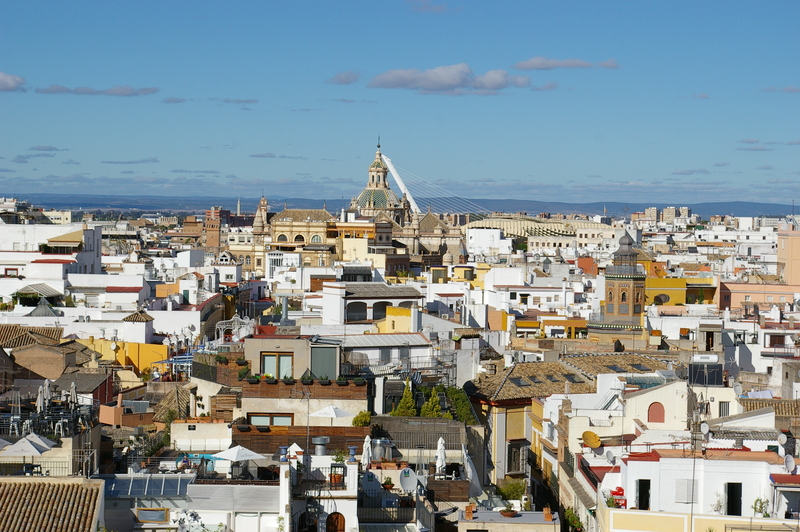 That wasn’t actually our intention when we visited Seville, but it was definitely what ended up happening. 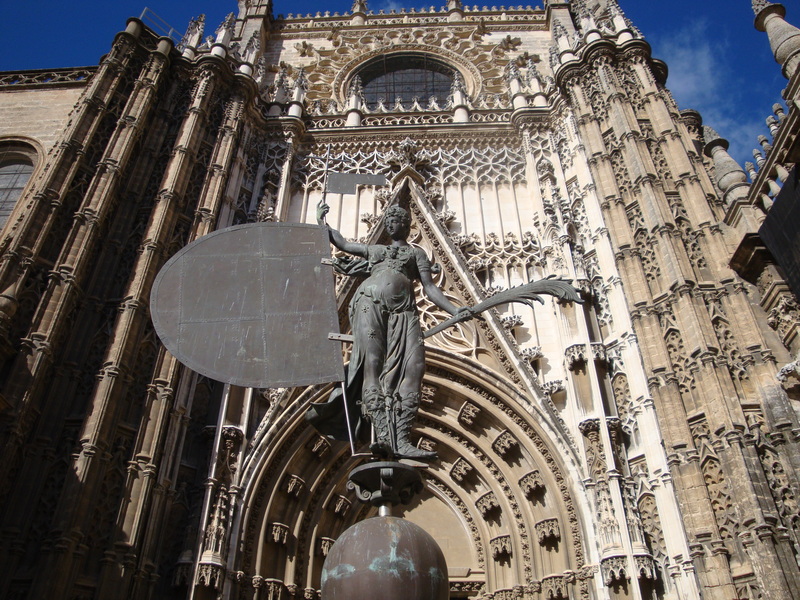 Seville is a gorgeous city with wonderful architecture, a vibrant history, and the largest bull fighting ring in Spain. 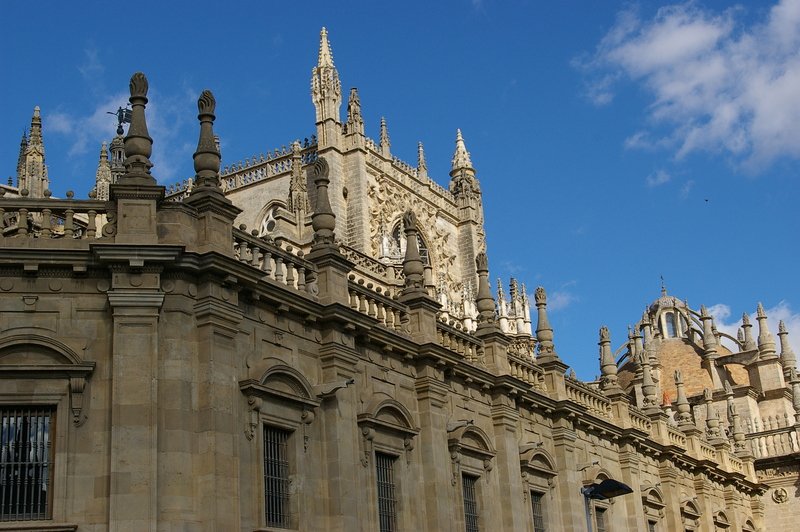 It is the capital of Andalusia and has wonderful sites such as the Alcazar Palace and the Cathedral of Seville. 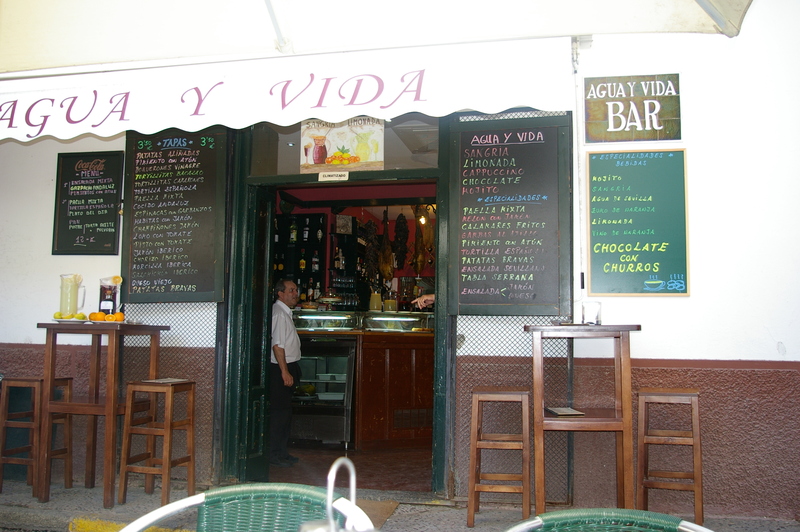 The food is excellent wherever you go in Spain, but while in Seville the Iberian ham is a definite must. 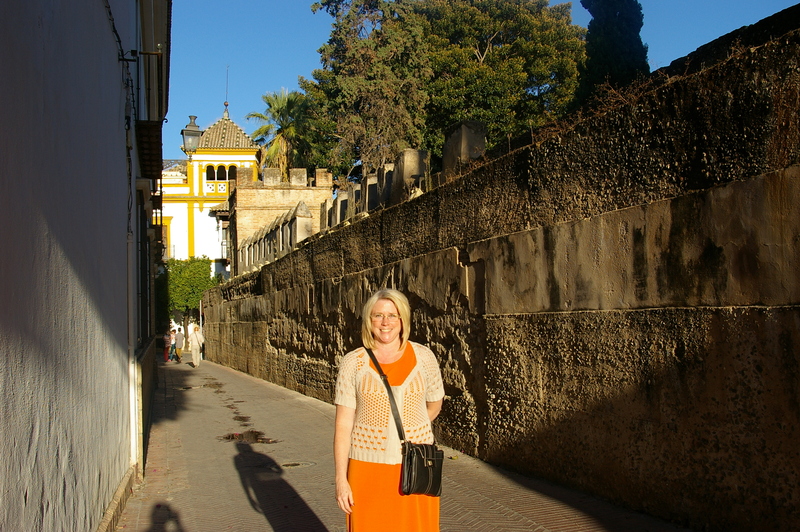 We drove to Seville from Estepona early in the morning so that we could make the most of our first day there. 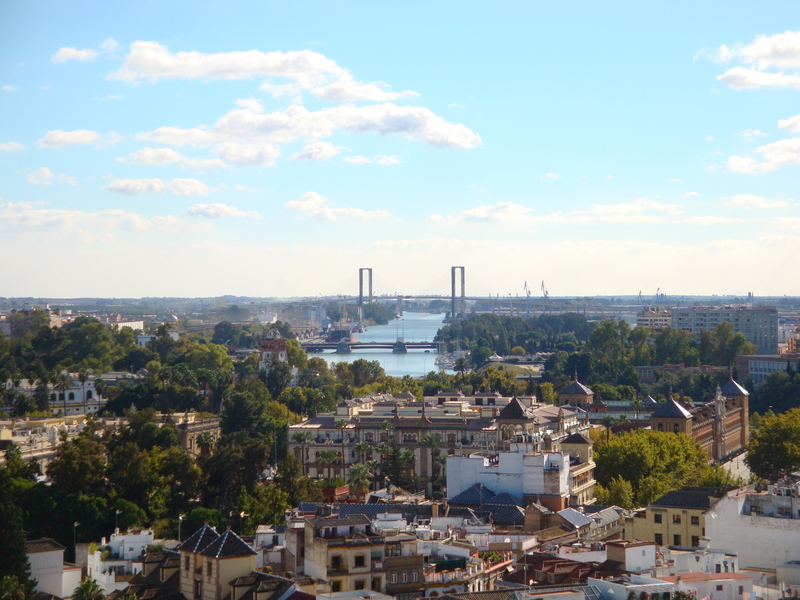 As we turned off of the highway and started to navigate our way to our hotel, we quickly realized that driving in Seville wasn’t as easy as navigating the highways. Street signs were hard to read, sometimes just on the sides of buildings, sometimes on the street corners, sometimes not to be found at all, at least by us. Our trusty MapQuest directions didn’t seem to match up with our surroundings. We seemed to have missed the turn that would take us to our hotel, so we turned around and reversed direction to see if we could find it going the other direction. Not having any luck, we saw a Ford dealership, so we figured we would stop and ask directions, hoping that since it was a Ford dealership, someone might speak English. We were greeted as soon as we walked through the door, obviously hoping that we were there to buy a car. In our broken Spanish, we explained that we were lost and asked if anyone spoke English. The manager of the dealership spoke a little English, so he came out to try and assist us. His English wasn’t much better than our Spanish, but through hand gestures and a few common phrases, we were able to make out the directions that he was giving us. As it turned out, we were actually heading the right way, we just needed to go a couple more blocks. Back on the road, in the heavy city traffic, we finally made it to the hotel and parked our car in the hotel’s underground garage. Glad to be out of the car, we were ready to make the most of our stay. We walked to the Old Town, which is the third largest in Europe, and started our adventure. We found a little restaurant near the Cathedral and had lunch. 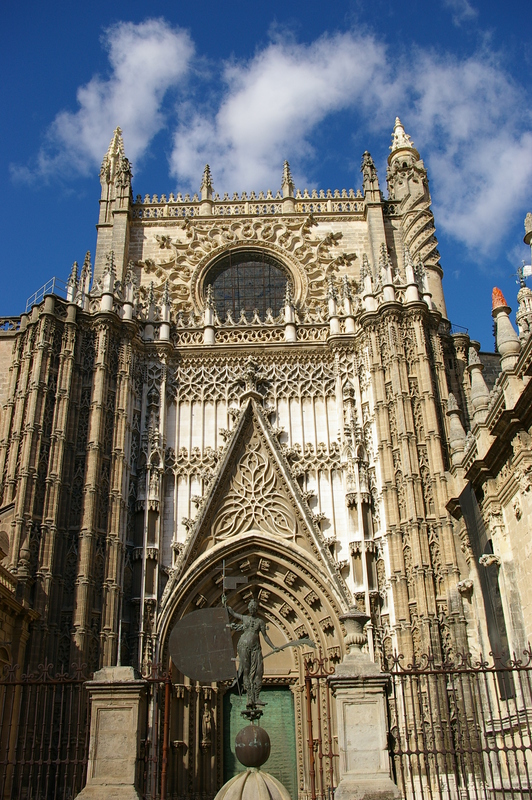 After lunch, we made our way past the gypsies trying to sell us flowers and asking for donations, and went into the Cathedral of Seville. It is truly a spectacular cathedral. 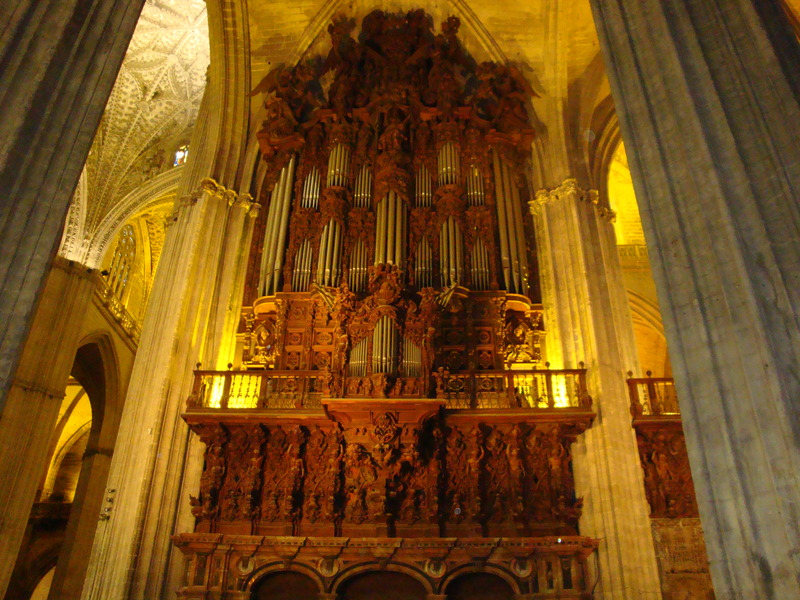 One could spend hours just looking at all of the immaculate artwork, statues, stained glass windows, and reliefs. 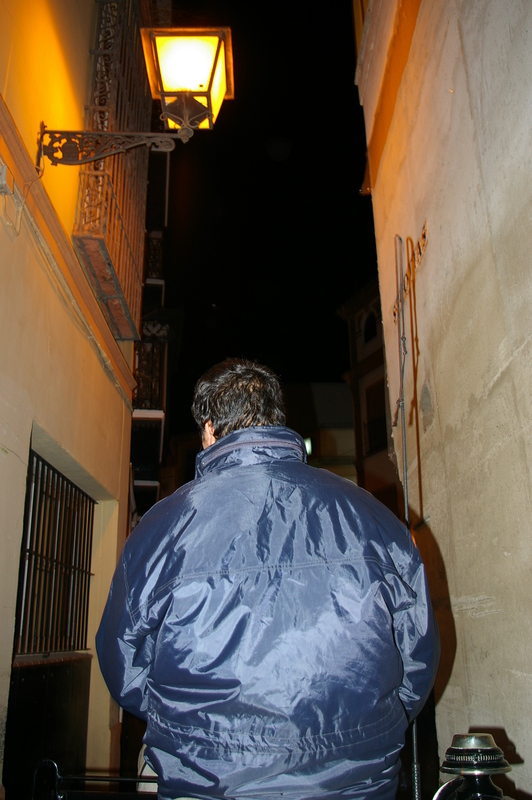 After enjoying the beauty of the Cathedral, we ventured into the Barrio, or the Old Jewish Quarter. 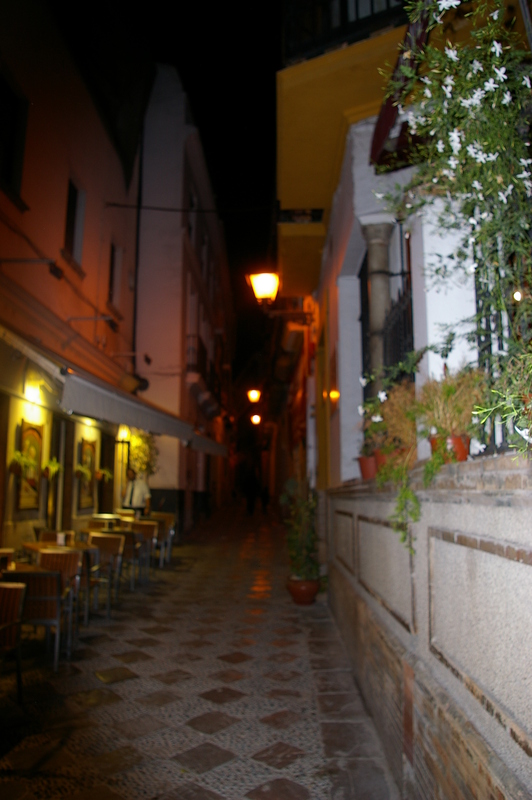 The Barrio Santa Cruz is a maze of small lanes with shops, plazas, and restaurants around every turn. They are too tiny for cars, but there are plenty of motor scooters and horse-drawn carriages. The buildings lean towards each other and the streets are so narrow that they are often referred to as the “kissing lanes” because the buildings look as though they are leaning to kiss one another. We found a little store that carried some amazing perfume, but decided to wait before buying anything as we wanted to explore some more. 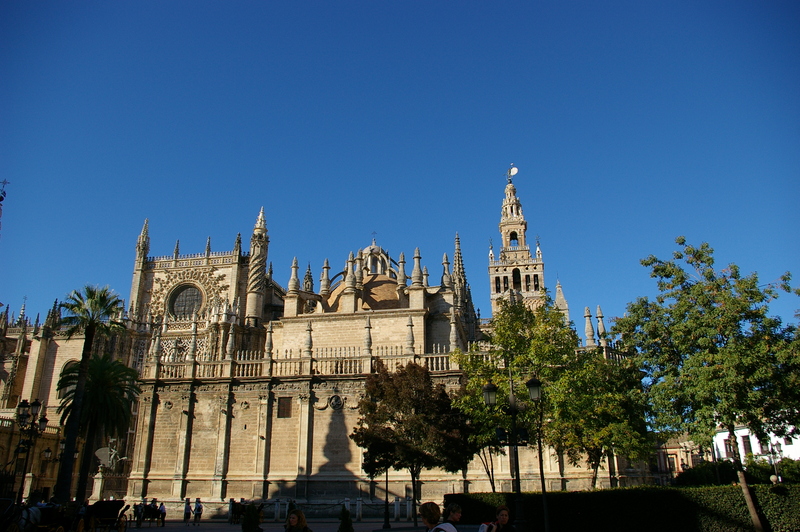 After several hours of walking around, stopping occasionally for a glass of wine and some tapas, we decided that we would head back to the Cathedral square, buy the perfume, and find a restaurant for dinner. Having walked through more than a dozen different side streets, trying to make our way back to the Cathedral square was turning out to be more difficult than we had expected. In fact, at this point, we were thoroughly lost. 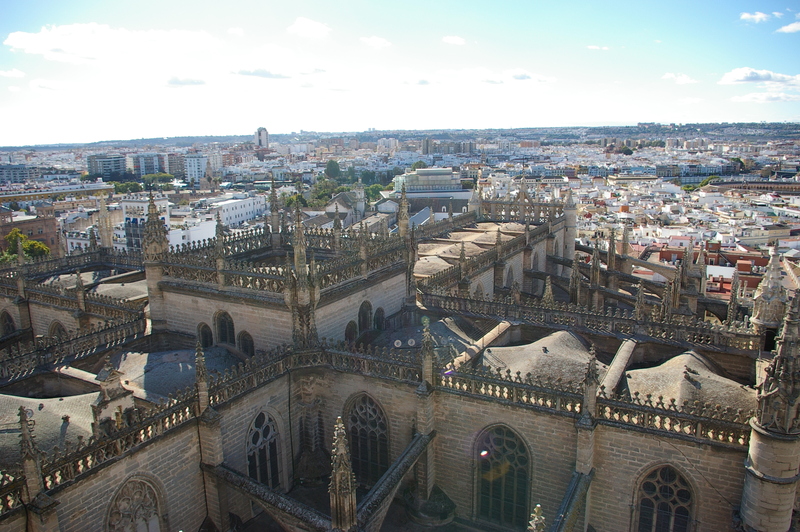 We thought that we’d been using the dome of the Cathedral as our navigation marker, only to find that it was the dome of another church. Now we were getting hungry, tired, and a little stressed. Every time we thought that we’d found a landmark that we recognized, we turn the corner to realize that we weren’t where we thought we were at all. At this point, the fun of walking into shops had lost its luster and we just wanted out of the Barrio. Finally, after hours of searching and the sun starting to set, we made it to a street that we truly did recognize. A block or two more and we were where we needed to be and found the little shop that sold the perfume, although by this time it was closed. We did eventually buy the perfume, but since we couldn’t at the moment, we went of to find a restaurant to get some dinner. Like Paris or other European cities, one of the great things about the small cafés is that they offer outside seating so that you can people watch while you eat. 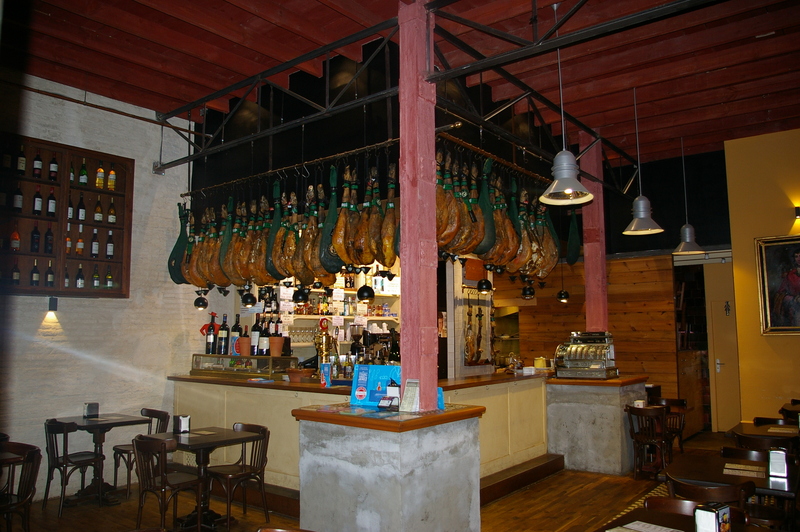 We found a little café with Iberian ham hanging all around the bar, so we decided that we would try some of the ham as we calmed our nerves from the ordeal of being lost. Iberian ham truly does live up to its reputation as being the most succulent ham that you can eat. It literally melts in your mouth like butter. In talking to the waiter, we learned that what makes the ham so tender is that the pigs are fed acorns. That is also what they use as they’re rating system, meaning that the ham could be a one, two, three, four, or five acorn ham, with five acorns being the highest rating. The more months of the year that the pigs are fed acorns, the higher the ranking. After dinner, we started walking past the Cathedral, through the throngs of gypsies, heading towards our hotel. There we saw the row of horse-drawn carriages waiting to take young lovers on a stroll underneath the starry skies and cooler temperatures. Since we’ll always be young lovers, we decided that was definitely the way to end our evening and let them take us on a little tour while we enjoyed each other’s company in the carriage. We approached the group of drivers and an older driver pointed us to a carriage. He then spoke to a younger man and from what we could discern, told him to take us on the tour. 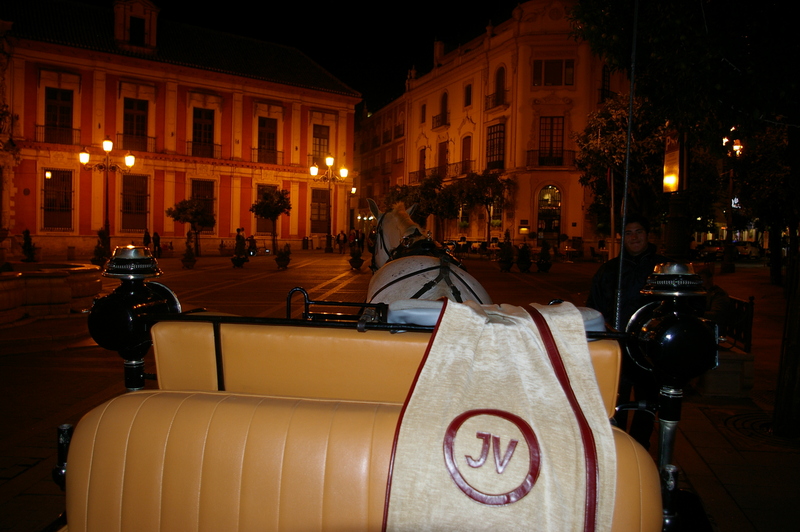 The horses hooves clickety-clacked on the cobblestone streets as we made our way back into the Barrio. After several turns, we came to a street that was closed due to construction. Our driver spoke to the workers for a few minutes, seemingly asking how to get around the construction, and then turned our horse in another direction. After another turn or two and we ended up heading into a dead-end street. With nothing else to do, the driver got out of the carriage and slowly moved the horse back and forth in order to turn us around on the narrow street. As we made the turn, the carriage bumped one of the parked motor scooters that line the streets, knocking it onto its side on the pavement. With an embarrassed smile, the drive hopped back into the carriage and quickly led us away. The driver’s phone rang, we assumed that it was the older man who had put us into the carriage and we also assumed that the man was our driver’s father. A few more turns on the narrow streets and we came to the same roadblock that had sent us on our diversion. The drivers head slumped into his hands, but we couldn’t help but smile at each other and giggle under our breath. So, back we went turning different directions than we did before. The driver’s phone rang again, more conversation, but the young driver had a little more defiant tone, obviously it wasn’t his fault that the road was closed :). As we made our way through a couple more streets, the driver started stopping and asking people on the street for directions. We seemed to be making progress when we turned the corner and… you guessed it, we were back at the construction roadblock. The driver looked at us, apologizing, obviously extremely embarrassed at this point. We smiled, we were fine, we looked at each other again and just laughed. We were now lost for the third time that day. Maybe we would never get out of the Barrio. Another phone call, a few more turns, and then there was that flash of recognition on the driver’s face, probably the same flash that we had when we finally found a street that we recognized. At this point we’d have been fine if he would have just taken us back to the Cathedral, but we’d paid for a tour and a tour was what we were going to get. Encouraging the horse to go as fast as possible, while quickly pointing out buildings and monuments as we hurried by, we got the proverbial “2 second” tour. 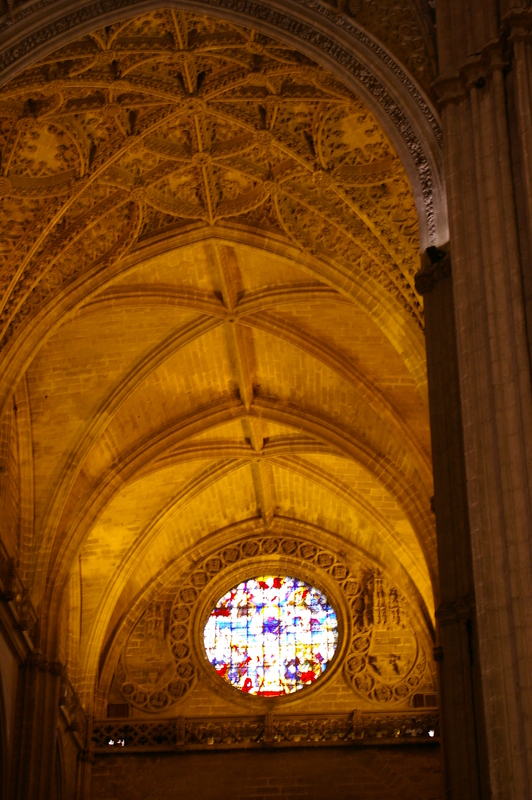 We arrived back at the Cathedral, honestly thanked him for the tour, we’d really had a wonderful time. We don’t think that his father, boss, or whoever he was, believed us, but we really didn’t mind. We went back to our hotel and crashed, thoroughly exhausted. Some other time, we’ll describe the rest of our trip to Seville and the things that we saw, but we just wanted to share one of those travel days where you can’t do anything except laugh and make the most of it. 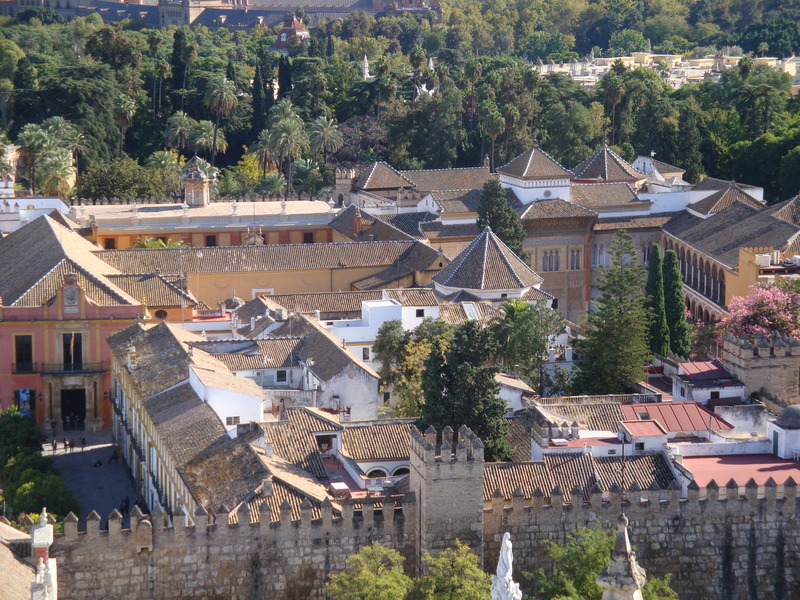 This entry was posted in Spain and tagged adventure, alcazar palace, andalusia, barrio, cathedral, Food, iberian ham, photography, seville, Spain, travel. Bookmark the permalink. Funny enough, I also got lost when I was in Seville. Those streets are pretty twisty, but I’m glad you finally found your way! Nice photos and stories. 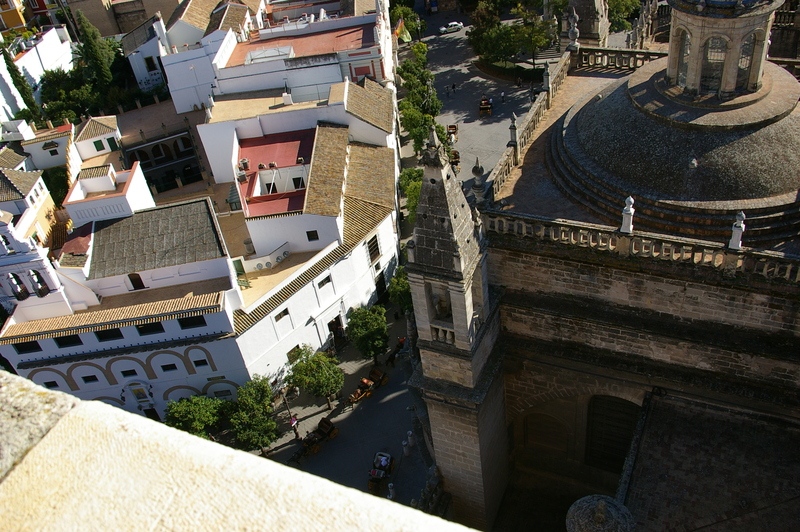 We got hopelessly lost in Seville’s old town. We were walking with suitcases, trying to find our apartment, in a maze of tiny streets at all sorts of angles, with few signs. Finally a guy at a bar had to take us to the door. 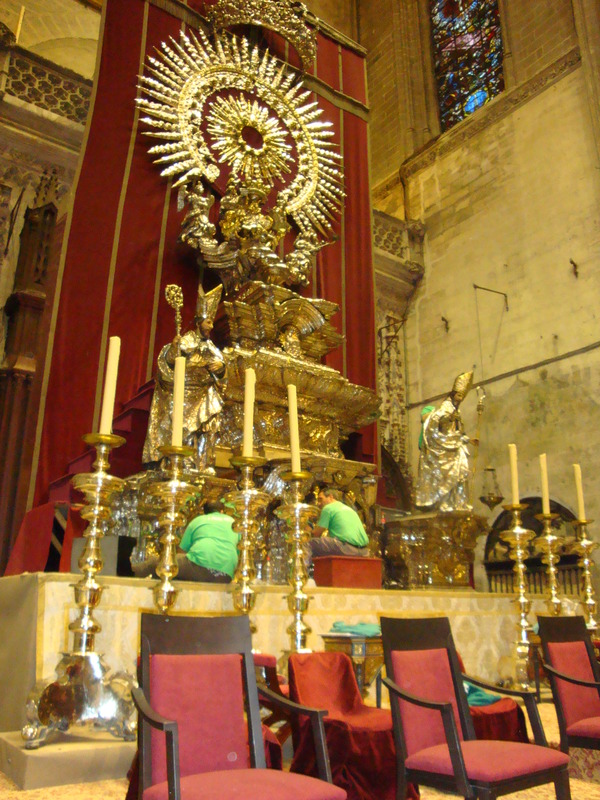 My post, titled “Lost in Seville”. Sounds like getting lost was more stressfull for you than us ☺. Great post. Thanks for sharing. Getting lost can be stressful as well as fun :). You can find some unique places that you may not have found.